Need a perfect last minute gift or stocking stuffer? I have Gift Certificates available by email and can get it to you ASAP! If you're stuck looking for the perfect gift for the paper crafter in your life and don't know what to buy them? 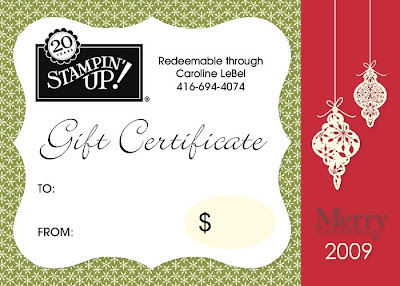 Get a gift certificate in any denomination and let them choose the Stampin'Up! products that is just right for them! Better yet, get one for YOURSELF and have your spouse pay for it :) Contact me for details!